Whether you want to just have a timing clock at your event or as an addition to chip timing, we can supply a variety of LED and flip-digit clocks and mounting tripods for your event. Clock rental rates start from as little as 125euro (incl VAT). If you want to provide manual timing at your own event then adding a printing timer can help speed up results on the finish line. 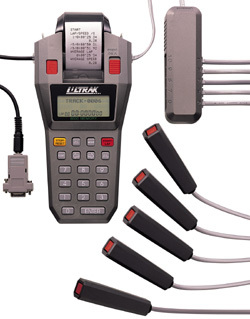 The Ultrak L10 can store 8000 splits and uplink the results to a PC for quick assembly of final results.